If you find that you just cannot make it through even one day on a full charge, then a self charging case is likely your best bet. 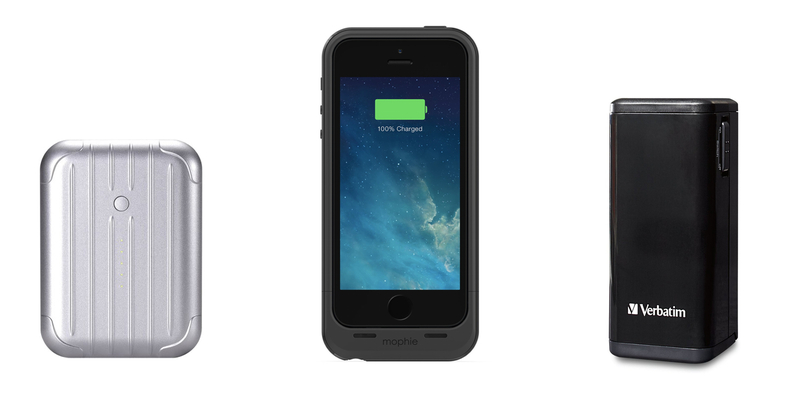 For the iPhone 5 and 5S, [company]Mophie[/company] has three different case chargers to choose from. The helium for $79, the air for $99 and the plus for $119. With the iPhone being so thin already, a charging case does not add all that much bulk. The difference between the three, besides their size, is how much battery capacity each has. The thinnest case has a 1500mAh battery and will charge your iPhone back up to 80 percent where the thickest has a 2100mAh battery that will charger 120%. Small, compact and with enough juice to keep you going for up to three complete charges, the 6000mAh Just Mobile Gum++ backup battery is great for those on the go. You can pack this $79 charger in your laptop case to keep you connected on even your longest of days. With so much juice, you don’t have to remember to recharge the charger every day as well. You can even get one of their AluCable Mini lightning cables to make things more compact. Even mobile chargers lose their power over time. And finding out on that rare occasion that you really do need a charge that your backup battery has also lost its charge is not good. In such cases, the Verbatim AA Power Bank Charger for $15 can use batteries like the Energizer Ultimate Lithium AA Batteries which can keep a charge for as long as 20 years. Store it in a convent place with a fresh set of batteries for the next time that the power goes out. No power, no batteries, and in the middle of nowhere. The Ambient Weather Adventure 2 solar-powered hand crank charger for $65 has been recently updated to include a 2200mAh internal battery. It comes with a standard USB port that can accommodate any external charging cable. Its solar cell slowly charge internal battery while the hand crank will certainly speed things up a bit. It is convent to pack on long hikes or overnight camping trips. we got the UNU case for our Iphone. It has a separate battery which can recharge your device. Love it.